Rejoice, citizens of the Gold Coast! No longer is Palm Beach offering its only sightseeing and entertainment spectacle, Centrelink. That’s right, it’s evolved and so have all previous connotations. These days, we’re struggling to find a car park, organising all social soirees at one of its many bustling venues and Palmy is also pumping out some pretty decent real estate, too. Yep. We’ve called it. Palm Beach is the new place to be—worthy of a visit for any activity, day or night. Hangry? Bored? Got cash to burn? Here’s your go-to guide for the best things to do in Palm Beach. If you’ve been living under a rock for the past 12 months, then you need to check this bad boy out. 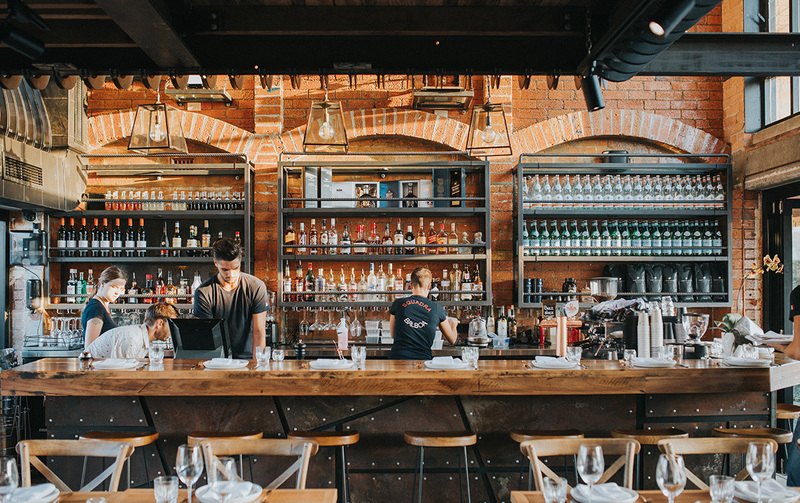 With five-in-one restaurants and a rooftop bar not too dissimilar to an outrageously Insta-worthy tropical resort bar, spend your day or night at The Collective knocking back some artisan-crafted cocktails and hanging with some of the best hospo staff around. With a sophisticated menu, your heart, tummy and eyes will be happy you made it here. The outdoor balcony and retractable roof at 8th Ave. Terrace perfectly compliments the GC lifestyle and with Sunday sessions coming back into swing, their live music and creative cocktails have never provided you a better excuse to skip out of Sunday chores. Wings, bacon-wrapped poppers, ribs, loaded fries, burgers and some pretty epic whiskey options to boot. Sign. Us. Up. Lester & Earl is decked out in wooden interior and dripping with so much mid-west culture, your love for all things deep-fried will make you think you’re Texan. Although it feels like it's already been there forever, the newest addition to the best things to do in Palm Beach is late-night watering hole, The Scottish Prince. 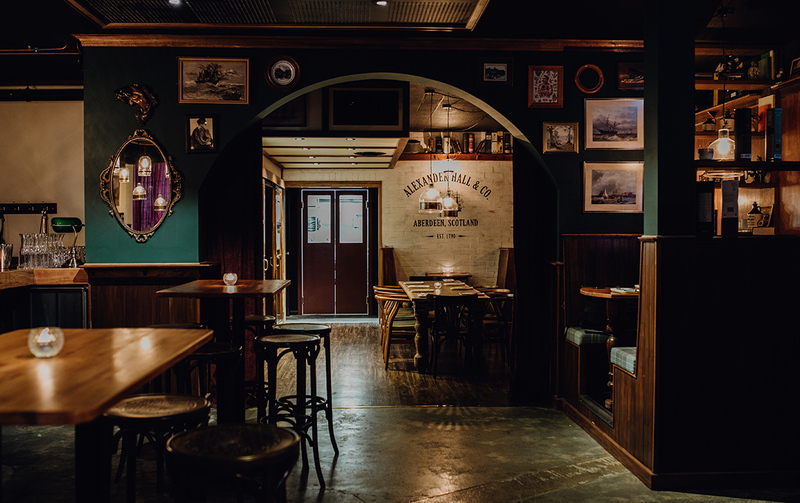 With some 150+ bottles of whisky behind the bar and more to come, it’s clear what your tipple of choice should be here. Not only are they killing the burger game, their drinks and loveable crew keeps us coming back for more. Yes, we’re burger addicts and not one bit ashamed about it. Located in the quiet Philippine Parade shops, Burgster is a delightful switch-up from being right on the highway and more intimate with the backstreets of Palmy. Bellissimo! Excuse us while we notch up on our Italian. If you’re like most and can’t be bothered with a move to Italy, then Balboa is the next best thing: authentic Italian cuisine AKA handcrafted pasta, wood-fired pizza, other life-giving carbs and copious red wines served in the most ridiculously stunning two-level dining room. Our jelly-bellies are already jiggling with giddiness! Best start practicing your new favourite sentence “uno más por favor” because that’s all you’ll be saying at Spanish-inspired tapas and wine bar, San Sebastian. Affectionately named after the Spanish coastal town, the pintxos tapas and flavours booming from this intimate eatery, promises your tastebuds a dance and the sangria to flow like water. With their adorable turquoise blue pick-up ute playing mascot out front, it’s hard to miss and you’ll be kicking yourself if you do. Opening seven mornings and some nights with a bright and breezy open-air dining room, Wildernis is a damn good choice for your next caffeine hit; in either cappuccino or martini form. Eddie and Cherie Uzan have absolutely nailed this one. A veteran on the 4221 dining scene, Avvia is proudly using local market ingredients to create meals blasting with flavours at its beach-side location, it’s easy to see why the husband and wife team have been Palmy locals for a long time. Now with a shiny new diggs, this Palmy staple has been around longer than Dame Edna. Okay, so not actually that long, but they were in Palmy before Palmy was the new Palmy. And there’s a reason why. 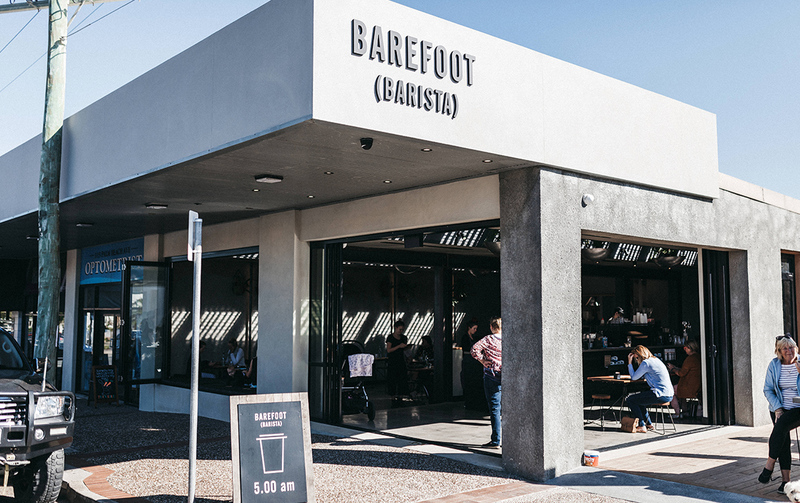 Take for example Barefoot Barista’s loyal regulars, their ability to always nail great meals and coffee even when under the pump and a pretty prime possie for ultimate people watching. These early risers are up before the sun and pumping out our wake-up juice (coffee- not actual juice) before we’ve even hit snooze five times. Like the best friend we all need, Espresso Moto offer no judgement when we drag our sorry butts in on a Sunday morning. So, go make acquaintance because you’re not living life if these guys aren’t your mates. This sister venue of the epic Miami Paddock and Bam Bam has answered all southern Gold Coasters prayers. Their standalone barista bar next to Talle Creek allows the southern snobs to stay below Burleigh but still get a dose of their crazy-good takeaway coffees, fresh squeezed juices, cookies and other baked goods. Yes, please! You can never drink too much coffee, right? Pumping out our much-needed caffeine hit seven days a week; Mr Bengel is a new neighbourhood favourite. Catering to quick pit stops or long catch-ups with pals is their main game and they’re absolutely killing it. Formerly known as Hendrixx, the vibe of Spikexx is unlike any other. With vintage décor designed to catch the eye and awesome meals to boot, this joint is always pumping. They’re also pretty famous for some epic jaffles, and who doesn’t love reliving childhood nostalgia and chowing down on jaffles? A monster, that’s who! Department Of Coffee is the friendly local that reminds us why cafes will never not be a thing we Gold Coasters love. With meals designed for quick access when on the run, you can’t really blame us for making it a pit stop when we’re running late, cough early, on our way to work. Get your phones ready, because all avid foodies will be snapping away when your food arrives, with vibrant colours and flavours to satisfy all your senses. Dune Cafe often hosts live music and is considered one of the Coast’s most kid-friendly cafes. So, go on, bring along your child tribe and settle in for an epic feed, then let them run it off in the parklands near by. A little off the beaten track, you'll find Third Base Coffee tucked a few blocks back, around the corner from our fave burger joint, Burgster. This relaxed family-run cafe welcomes you in with a classic all-day breakfast menu and a smooth cuppa joe. If you love knowing where the locals disppear off to come weekends, this is often where you'll find them. Health conscious, unite! This favourite is the perfect pick-me-up for an acai, smoothie or organic treat. Flat out during the warmer days, you’re always guaranteed a delicious feed with only the best natural ingredients at Down 2 Earth Organics... don’t mind if we do. Hola, Amigo. 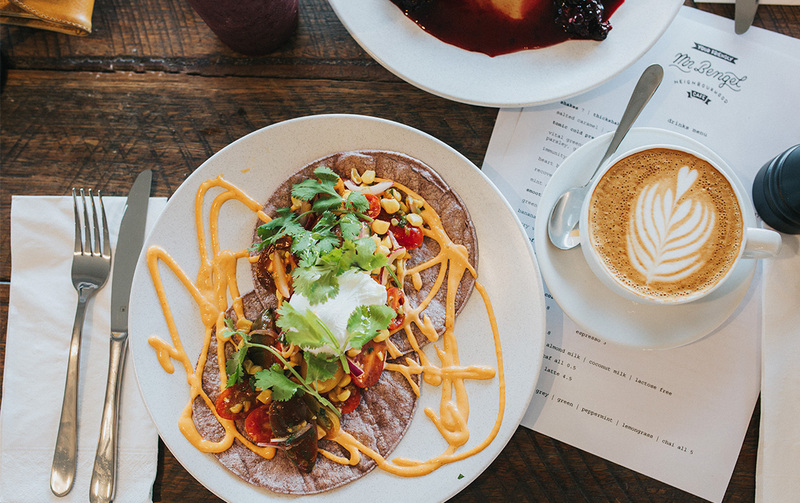 This fun little Mexican eatery is combining their love for Mexican cuisine and healthy eating. Got a hankering for burritos, quesadillas, tacos or nachos? Well go feed that pie-hole of yours at Goodness Gracias and rub your tummies in appreciation. Since opening in 1930, it’s the heritage of Palm Beach Surf Club that we like. Always doing good and making sure we’re safe in the water, the restaurant also offers a decent view as well. Perch up on the deck for your shore side indulgence, buy a few meat tray raffle tickets and hang with some salty ol’ locals. Need a new local for the summer? You’re pretty much an alien if you don’t have a local fish and chips joint. So, make 7th Ave. Fish & Chips yours, order those potato cakes and dimmies and get on down to the beach for an epic GC sunset. G’day Aussie life, we bloody love you! White Bohemian is the store any stylish girl needs. Stocking labels from One Teaspoon, Arnhem and Spell Designs to name a few, this is ultimate for the bohemian-luxe style tailored to meet the everyday woman. 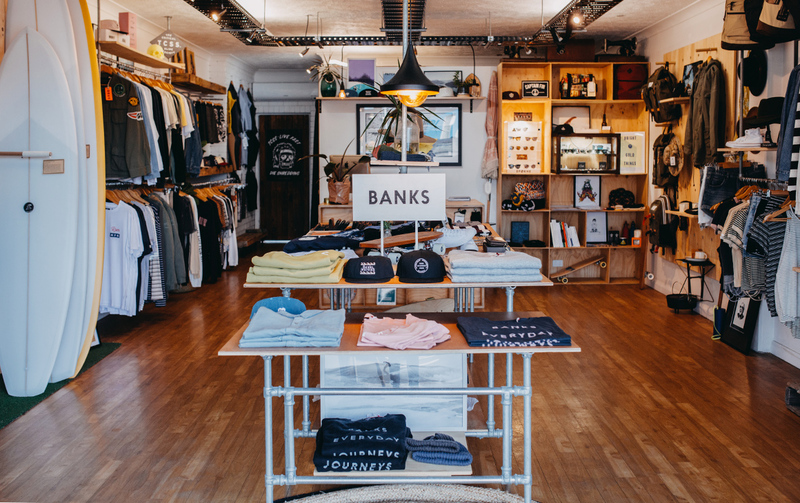 Inspired by the life and style of surf, skate and snow, Palm Beach Surf Store should be a go-to for any thrill junkie who also loves a laid-back style. Stocking brands from RVCA, Rhythm and Brixton, these gents have got you sorted for any apparel needs whether sport or fashion based. Specialising in women’s fashion, Bonita Boutique is always a great option if you’re looking for a staple in your closet. With bold patterns and styles designed to suit any body type, chances are you’re going to find a goodie in here. The epitome of the casual-cool style that represents the GC, if you’re looking for a relaxed vibe that says ‘I didn’t even try but, damn, I still look bloody good’, then Fifth Gear Store is your joint. Oh, hello, interior heaven! This store basically showcases how you’ll want your house to look. For those lacking the interior design talent (like us), The Haven Trader also offers a home interior styling consultant. This one’s for the kiddies (and mums, obvs). Located right on the highway, Little Maisy is not hard to miss. Offering everything from clothing, toys, décor and accessories, this is the store that husbands should be afraid of, because it’s where all your income is going come pay day. The Craft Parlour is for the whole family and one of the best things to do in Palm Beach. Making getting creative cool again is what these gals do, with owner Rachael, a life-long creator; she’s dedicated her life to teaching others about the arts. With workshops varying from water colouring, knitting, naked cake decorating lessons and ceramics, it’s the perfect activity for hens dos, kids parties or just any occasion where you find yourself lacking something fun in your life. There’s nothing better than a day out in the sun, right? Wrong. Throw a dog park into the mix and there’s one better. The Palmy Parklands, situated right next to Currumbin Creek, offers the ideal opportunity to get out of the house. Take a picnic, go for a swim and let the pup run free at the designated dog beach. What a day! These guys have got any activity sorted. Fishing, boating, biking, SUP-ing, kayaking. Got literally no idea what you want to do with your day? Action Outdoor Hire have your answer and can be found any sunny day at Tallebudgera Creek. Saturday is the day where all us southern GC’s congregate to stock up on sustenance. That’s right, the social calendar is full with this local fave. 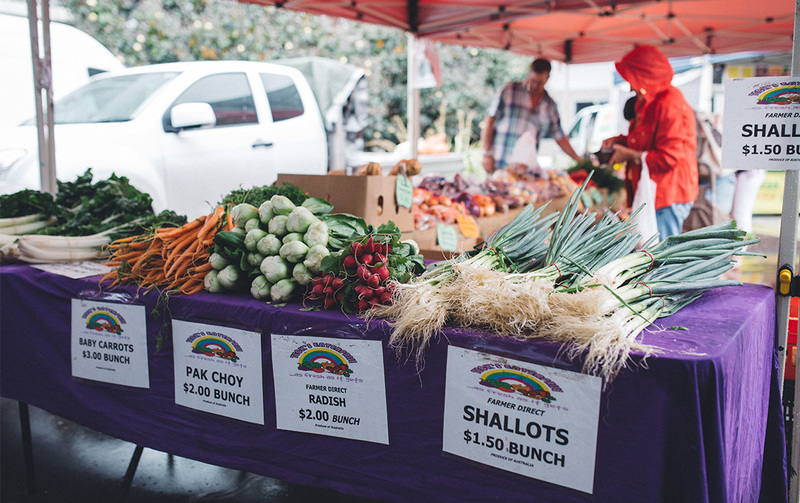 Happening every Saturday morning at PBC High School, Palm Beach Currumbin Farmers Markets is your chance to score some of the best organic produce for really small bucks—do your health and your wallet a favour. If the crystal clear creek isn’t enough to make you swing a u-bolt and park up, then knowing you could jump in on a SUP might do the trick. Surrounded by the stunning canopy of Burleigh Headland, a visit to Tallebudgera Creek is a welcome change from the surf beach and usually a good option if it’s blowing a gale, too. With views across both the northern and southern end, catch a sunrise/set or a stroll on the squeaky soft sands of Palm Beach; it’s pretty much a hotspot for a quiet sunset where you’re not bumping into at least 20 other people that you know. Conquered our hit list of things to do in Palm Beach? Travel further south across the bridge to explore the laidback lushness that is Currumbin.